Manufactured by Anatometal, using Implant Grade 316LVM Surgical Steel. 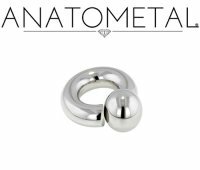 These 4g Anatometal Surgical Stainless Steel Screw on Ball Rings are hand polished to a mirror shine, Anatometal's surface finish is recognized as one of the best in the industry. Screw-on ball rings have the comfort and look of a captive without the need of opening pliers, as the ball screws off. Because the ball screws off the ring, there is a considerable gap between the ball and the other side of the ring. Due to this, these are not appropriate in all piercings, especially 'below the belt' piercings. Inner Diameters: 5/8", 11/16", 3/4", 13/16", 7/8", 15/16", 1", 1 1/8", 1 1/4", 1 3/8", 1 1/2", 1 5/8", 1 3/4", 1 7/8" and 2"